Item description: Published letter, dated 28 August 1863, of Genl. W.J. Hardee on the topic of organizing paroled soldiers. Item citation: From folder 9 of the James T. Harrison Papers #2441, Southern Historical Collection, Wilson Library, University of North Carolina at Chapel Hill. 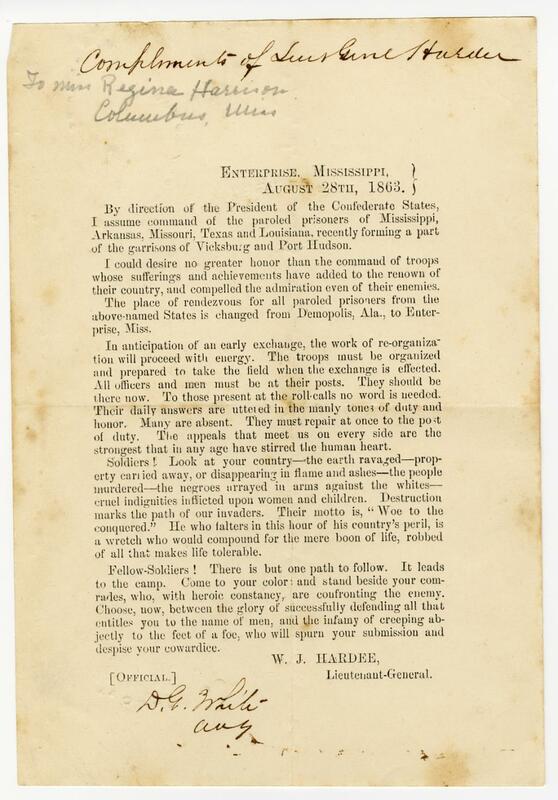 By direction of the President of the Confederate States, I assume command of the paroled prisoners of Mississippi, Arkansas, Missouri, Texas and Louisiana, recently forming a part of the garrisons of Vicksburg and Port Hudson. I could desire no greater honor than the command of troops whose sufferings and achievements have added to the renown of their country, and compelled the admiration even of their enemies. The place of rendezvous for all paroled prisoners from the above-named States is charged from Demopolis, Ala., to Enterprise, Miss. In anticipation of an early exchange, the work of re-organization will proceed with energy. The troops must be organized and prepared to take the field when the exchange is effected. All officers and men must be at their posts. They should be there now. To those present at the roll-calls no word is needed. Their daily answers are uttered in the manly tones of duty and honor. Many are absent. They must repair at once to the post of duty. The appeals that meet us on every side are the strongest that in any age have stirred the human heart. Soldiers! Look at your country – the earth ravaged – property carried, or disappearing in flame and ashes – the people murdered – the negroes arrayed in arms against the whites – cruel indignities inflicted upon women and children. Destruction marks the path of our invaders. Their motto is, “Woe to the conquered.” He who falters in this hour of his country’s peril, is a wretch who would compound for the mere boon of life, robbed of all that makes life tolerable. Fellow-Soldiers! There is but one path to follow. It leads to the camp. Come to your color and stand beside your comrades, who, with heroic constancy, are confronting the enemy. Choose, now, between the glory of successfully defending all that entitles you to the name of men, and the infancy of creeping abjectly to the face of a foe, who will spurn your submission and despise your cowardice.